The daughter of Tommy Tucker (of “Hi-Heel Sneakers” fame) has been playing the blues circuit for years. As a vocalist, she has made a name for herself with her brassy delivery and original lyrics. Tucker’s cohort is guitarist Robert Hughes, who is skilled in all aspects of the blues. When a song needs slinky fills or big solos, he supplies them. When a gospel-tinged song calls for a melodic solo with a tough sound, he’s there. Shuffles with jazz turnarounds are no problem. A funky, almost disco-tinged tune gives Hughes the chance to play a pinched note solo that fits the music perfectly. On at least two cuts, he supplies perfect acoustic country-blues accompaniment for Tucker’s soulful vocals. And while his solos are always on the money, his support of the vocals with fills is uncanny. While Tucker’s songs at times plead for the blues to live on, that shouldn’t be a problem with singers like her and players like Hughes, who so fully understand the music. TORONTO - When I saw a video on YouTube of Teeny Tucker singing Keep the Blues Alive, I was blown away. I’d never heard of her before, and became an instant fan. Here’s why: I love blues and gospel, and I’ve always liked singers like Etta James and Koko Taylor who had big, brassy voices. Teeny Tucker is a blues belter of the highest order and she deserves all the props she’s getting from fans and critics in the blues world. Speaking of James, check YouTube for a video of Tucker singing James’ signature song, At Last. She’ll give you chills. Tucker is at Woodbine Park Sunday at 4:30 p.m. as part of the seventh annual Waterfront Blues Festival and you don’t want to miss her. Tucker, who’s been nominated for a 2011 Blues Music Award for best traditional female blues artist, was born in Columbus, Ohio, and her dad, Tommy Tucker, had a hit in 1964 with a song called Hi-Heel Sneakers. She was born that year, but only began singing professionally 10 years back. Tucker has released three albums so far and has become the darling of the blues world. Her latest is Keep the Blues Alive. Teeny Tucker "Keep The Blues Alive" TaBo 2010. The blues has been here for us since long before any of us were walking the Earth. Great blues transcends eras, and is just as easy to understand now as it was in the genre's infancy. 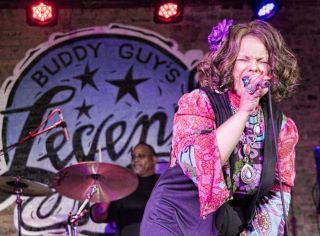 One of the modern blues greats on the rise is Teeny Tucker, and her latest album, "Keep The Blues Alive", will likely do just that. A next generation blues star with music in her genes, Teeny Tucker is ready to take her place among the greats of modern blues. Her guitar playing is second to none, and her vast life experience, playing both for and with the legends of music, has paid off well for her. "Keep The Blues Alive" is the result of a student schooled to the game by legends, doing her best to earn her spot. Of all the songs on this collection, "I Wish We Could Go Back" stands out as the best. It offers genuine feelings that are easily understood and relatable. I can see this track, along with a few others, challenging the current Top Ten in the blues charts very soon. From top to bottom, "Keep The Blues Alive" is a great album, worthy of mass success and critical praise. It is always a good thing when a modern blues record puts a smile on your face. Let Teeny Tucker brighten your day with her love of the blues. Teeny Tucker, like so many children of Blues performers, could likely perform the songbook of her famous father, and get gigs pretty regularly; but Teeny has gone against the grain in that regard to forge her own career in the music industry through hard work and raw talent. The Dayton, Ohio native grew up singing in the church and listening to her father, Tommy Tucker (who's hit song "Hi-Heel Sneakers" has been covered by more than 200 artists and bands.) Teeny didn't decide to pursue a career in music until late 1996, and since she made up her mind, she's been building a head of steam ever since. Now she's poised to break through on a larger scale. Teeny Tucker's previous album, 2008's Two Big M's, was selected as one of six finalists for "Best Self-Produced CD of the Year" by the Blues Foundation at the following year's I.B.C. That momentum caused an upswing in gigs and festival bookings, as well as a creative swell that carried into her latest album, Keep The Blues Alive. The album kicks off with the socially conscious "Ain't That the Blues," a tune that profiles the heartbreaking situations of it's subject, a young female who lost her mother and goes to live with her father, who lives in his vehicle. It's the first of eight songs on the album featuring lyrics either written or co-written by Teeny Tucker. It's heavy stuff, no doubt, but performed with conviction in an arrangement that really hits an infectious groove. You're instantly wanting to hear more from this album to see if they can keep up the great work here. "Make Room for Teeny" is a cool, biographical tune that was actually written by Pam and Lee Durley, not Teeny herself. Tucker belts lines like "Don't mean to cause alarm, and sure don't mean no harm. But, Teeny's in the house to raise the roof." This is a party song with some standout work by drummer Darrell Jumper and pianist David Gastel. "Daughter To the Blues" is another biographical song, this one written by Teeny herslef, and with a slower tempo. The songs are two sides of a figurative coin, possessing the same subject with a different approach on each. Gastel switches to harmonica here, and does equally as well, especially growling his way through a solo about halfway through the track. Guitarist and executive producer Robert Hughes' playing is some of the best, here, as well. I saw in a video interview that "Old Man Magnet" was inspired by a conversation that Teeny had with some of her backup singers, talking about a certain type of fan that approaches the ladies often out at festival gigs. It's another fun track that actually is has that "girl power" vibe, because most of the vocals deal with a woman taking care of herself and keeping a wonderful, classy appearance that attracts a more mature type of man. Cool stuff. "I Wish We Could Go Back," clocking in near the seven-minute mark, is the longest song on the album, a slow burner that features some terrific Hammond organ from Linda Dachtyl (who also plays on the opener, as well as "Heartbreak"). Hughes remarked in the liner notes, "This is Teeny at her best!" She certainly pours her soul into the song, and there's a lot going on here vocally, as Teeny really shines on the microphone. The songwriting is excellent, as well. The title track has one of the strongest Gospel influences on this record, in my opinion, taking on the feel of an old spiritual as Teeny and her singers belt the introduction a'capella. That vibe doesn't stop there, either. It carries on once the musicians kick in, and you find yourself grinning and clapping as the tune really gets going. This is one of my favorite songs on the album! That's followed by "I Live Alone," a tune co-written by Teeny and Eric Blume. Hughes is responsible for all of the arrangements on the album, save for "I Live Alone," although he plays on the track, and very well, I might add. "John Cephas" is a gorgeous acoustic track that salutes the life of the great musician, and one of the best ambassadors that this music has ever known. In the album's liner notes, you get a sense that Robert Hughes took the passing of John Cephas very hard, and he notes that this song was born of Teeny's efforts to help the cathartic efforts to relieve the heartache. Many of the greats of the genre, friends of Cephas, are also mentioned in the song, and the arrangement of simply guitar, harp, and vocals suits it perfectly. "Respect Me and the Blues" wraps up this 11-song set of tunes from teeny Tucker and company. It's yet another great example of Tucker's songwriting pulling from real life. This time, Tucker lays it all out for those who would have her sing another style of music. Tucker wonderfully tells 'em how it is, and leaves it up to all of us to "Respect" it or not. The song is a great closer for this album, and the arrangement is cool, here, as well; with Tucker's vocal over Hughes' electric picking. Standout Tracks: The title track, "John Cephas," "I Got My Mojo Workin'" and "Respect Me and the Blues"
two covers, “Heartbreak” by Joe “Cornbread” Thomas and C. Hoyle is a strong re-work featuring exquisite Hammond B3 organ by Linda Dachtyl. The keys fill the bottom while guitar and harp pump up the rhythm. Teeny’s vocals showcase her four-octave range on both sides of a tasty organ solo. I plan to air this song this week! - Blues Blast Magazine Review of "Voodoo To Do You"
Being a Blues CD reviewer and Blues radio show co-host, I encounter hundreds of albums per year. Imagine the range that appears, from sadly amateurish to inspiringly great. In almost every case, what separates the exciting album from the mundane is the quality of the vocals. And, honestly, how many truly exceptional, contemporary vocalists are there? My radio partner and I have not found many! Dayton, Ohio’s Teeny Tucker is the best female Blues vocalist on the scene today! Her singing has a tone that is just instantly pleasing, no matter what the subject matter of the song. Her voice has superior qualities in passion, timbre, pitch, range and volume that define modern Blues. Now, add to that Teeny’s songwriting, backup singers, loyal touring and studio band-mates, and musical director, co-writer, and guitarist Robert Hughes, and you have a stellar combination showcased wonderfully and most recently in Teeny’s third CD, “Voodoo to Do You.” Besides Hughes, complementing Tucker are David Gastel on harmonica and keyboards, Robert Blackburn on bass, Darrell Jumper on drums, Mary Lusco-Ashley and Paula Brown – background vocals, and Linda Dachtyl adds Hammond B3 and piano to four tracks. Across the set, Teeny Tucker, daughter of Tommy “Hi Heel Sneakers” Tucker, knows just the right notes to cast a spell on listeners. Since the beginning of her professional singing career in 1996, Teeny has mesmerized genre aficionados with releases such as 2008’s award-nominated “Two Big M’s” and 2010’s “Keep the Blues Alive.” Each of the thirteen selections on “Voodoo…” (five originals and eight covers, including a stunning, masterpiece version of Reverend Gary Davis’ “Death Don‘t Have No Mercy”) centers on the tantalizing titular subject. All of them showcase Teeny’s vocals magnificently, especially the three original compositions featured below. Track 03: “Love Spell”--Some blues melodies spontaneously combust into high-octane lyrics and roaring instrumental riffs, but “Love Spell” is a slow burner. As Teeny yearns for the delightful early days of a fizzled romance, Robert Hughes’ mid-song guitar solo and Linda Dachtyl’s Hammond B3 organ turn up the heat. “I wish things were the way they used to be,” our lovelorn narrator laments, followed by her demand: “Hey, I need you to reach inside and cast a love spell on me!” Perhaps more than any other track on this album, “Love Spell” captures the essence of Teeny’s potent musical voodoo. Track 13: “Sun Room”--This previously-unissued track has a unique history. Says Teeny: “...We recorded [it] live at the world-renowned Sun Studio in Memphis, Tennessee. We wrote it a few hours before recording the PBS series [“Sun Sessions”]. Listening to Robert [Hughes’] knowledge of the Sun history shaped the song’s lyrics for me. I was thrilled to have the Teeny Tucker Sun Sessions episode shown on PBS TV in every major market in the USA.” The song itself is a swinging celebration of this legendary studio, complete with guest background vocalist Jackie Tate and bassist Scott Keeler. Blues fans: enjoy this vocalist and entertainer extraordinaire in her prime. Teeny has never been better, and the band is squeaky tight. And, if you are weary of cold weather and slate-colored skies, Teeny has some “Voodoo to Do You” and banish the winter blahs! Reviewed by James "Skyy Dobro" Walker and Rainey Wetnight. WHOA! Stand back from those speakers cos this release will rock you to your very soul. The first track `Voodoo Woman (They Call Me The)' sets the bar really high and hard. Guitarist, Robert Hughes breaks out with a string lashing, plectrum mashing intro and the song takes off to heights unseen in a good while. Ms. Tuckers' voice has never been stronger, and more emotional than here and now. Recalling the glory of Koko Taylor's version, Ms. Tucker has fun with the lyrics and in doing so tosses her hat into the ring of Best Female Blues singers. Ms. Tucker offers us an original tune `Love Spell'. It's musical arrangement (by Mr. Hughes) fits hand in glove with this release and again Ms. Tuckers vocals are impassioned and impressive. The addition of Hammond on this and several other tracks by Ms. Linda Dachtyl adds a ripe fullness to the overall sound and at times creates and eerie presence that's floats like a shadow upon a half-opened door. A note this track has advanced to the finals in the International Song Writing Competition. Covering Ms. Laverne Baker's `Voodoo Voodoo' it remains true to the rock and roll feel of the original but freshens it up with a tad more spice and ya ya as the band rocks and reels thru it at breakneck speed and does it in 2:55 a new world record! A classic `voodoo' themed song has always been Charles Sheffield's `It's Your Voodoo Working" Released in 1961 this Excello release has enjoyed some new found popularity (probably more than the original release) these days and Ms. Tucker understands the ins and outs of how to frame a lyric, word or pause on this number. With a scratching rhythm and solid drum beat it launches Mr. Hughes to new heights on this guitar solo and then it fades into an amorphous sound by Browse to Save" href="http://www.amazon.com/review/R2TL1J9RFVQG14">cloud as the keyboards swirl and mix it all up and replants it back on the drum beat provided by Mr. Darrell Jumper. Yeh it's your voodoo workin' and I can't get enough. Getting their funk on we get the sagely advice of `Muddier Things Get'. With a clavinet sounding guitar riff setting the stage (think seventies soul) Ms. Tucker signs of how when things get really muddy in our live - clarity is usually right around the corner. Mr. Hughes accompanies himself over that clavinet guitar with a tone rich solo that has just the right bite to be funky but not a throw back copy. Nice harp work by David Gastel adds to the whole aural landscape and fills it out nicely. Contained within this release are three bonus tracks that are splendid additions to the whole package. Cover versions of by Browse to Save" href="http://www.amazon.com/review/R2TL1J9RFVQG14">Skip James' `Hard Times Killing Floor' and `Death Don't have No Mercy' by Rev. Gary Davis. Both of these done with a fresh approach and respect for the song - which is how it should be. The other by Browse to Save" href="http://www.amazon.com/review/R2TL1J9RFVQG14">bonus track is a Ms. Tucker original `Sun Room'. This is Ms. Tucker's tribute to Sun Studios and the magic/voodoo that went down there. Smart lyrics that allow for vocal calisthenics and a banging rhythm section plays true to the feel of Sun Studios at 706 Memphis Avenue in Memphis Tennessee. The legacy of family bands and multi-generational musical lineage is a strong one in the history of the blues. Some of the best blues musicians performing today come out of this tradition. Lurrie Bell; Teeny Tucker; Cedric, Duwayne, Kent, and Garry Burnside; Kinney and David (Malone) Kimbrough; Sharde Thomas; Rev. John Wilkins; Eddie Jr., Larry, and Demetria Taylor; Chris Thomas, and this issue’s cover artist Kenny Neal are all sons, daughters, and even grandsons of earlier popular bluesmen. Kenny Neal’s family legacy is rich and deep. The son of Louisiana bluesman Raful Neal, Kenny (and most of his sisters and brothers) grew up playing music, eventually backing their father and, later, a who’s who of blues musicians as the house band at the Isabella Hotel in Toronto. At age 55 Kenny Neal is carrying on the legacy of his family name with a new major release planned for this fall and two children of his own (Kenny Jr. and Syretta) who perform with him. We continue our look at the Nashville blues scene with Tim Ghianni’s feature on James “Nick” Nixon. Nixon was the leader of one of the first racially mixed bands in Nashville in the 1960s and has been a central figure in the city’s R&B scene for over 50 years. This issue also features a story on guitarist Melvin Taylor and young blues phenom Selwyn Birchwood, who recently took top honors at the IBC awards in Memphis. We also have a wonderful photo essay by folklorist George Mitchell from his remarkable 1967 trip to the Mississippi hill country, where he first met Otha Turner, Jessie Mae Hemphill, R.L. Burnside, and Mississippi Fred McDowell, among others. This weekend marks a very special anniversary in the blues world. It was 60 years ago that Bob Koester recorded and released his first album, by a vintage jazz group from St. Louis called Sammy Gardner and the Fabulous Windy City Six. Thus began the amazing legacy of Delmark (then Delmar) Records. Junior Wells’ Hoodoo Man Blues, Magic Sam’s West Side Soul, Robert Jr. Lockwood’s Steady Rollin’ Man, J.B. Hutto’s Hawk Squat, Jimmy Dawkins’ Fastfingers, Otis Rush’s Cold Day In Hell, and Big Joe Williams’ Blues on Highway 49 all were recorded by Bob Koester. And this is just one part of his musical legacy. Koester has released over 500 records, over 300 of them jazz albums, owned the Jazz Record Mart in Chicago, employed and mentored a who’s who of future blues label owners and scholars (Jim O’Neal, Bruce Iglauer, Michael Frank, Peter Aschoff). He even gave the seed by Browse to Save" href="http://www.livingblues.com/#">money to start Living Blues magazine. At age 81 Koester is still going as strong as ever with new releases on Tail Dragger, Arthur Crudup, and Lurrie Bell out now. Hats off to you, Bob…and thanks! It’s time again to vote in the Living Blues Awards. We’ve got a knockout batch of nominees this year and an expanded field of choices. I’ve also added a Best Blues Book category, so turn to page 79 and check out the ballot, and then go to www.LivingBlues.com and vote digitally. It’s the fastest and easiest way to vote. Due to space constraints I have decided to move our written classified ads to our website. New ads will post and the list will be updated with the release of every new issue of the magazine. And don’t forget, the Living Blues Radio Charts are now posted monthly on our website as well. We lost one of the great Chicago bluesman and a great friend of Living Blues a few weeks ago. Jimmy Dawkins died on April 10 at his home in Chicago. Dawkins was a principled man whom you could count on and trust. He was a remarkable guitarist and songwriter as well as a label owner (Leric Records). He was politically and socially conscious and served as a mentor to numerous young musicians. Dawkins even wrote for LB for a time. A full obituary can be found on page 78.